An old friend returns, with his eyes on one Narukami in particular. 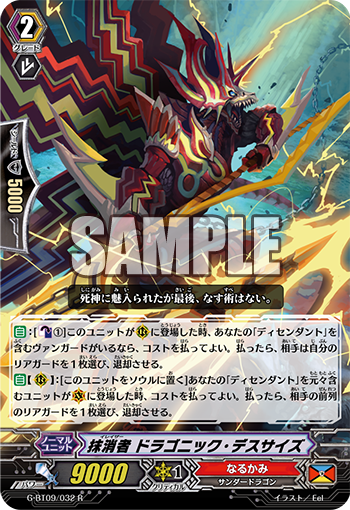 AUTO: [CB1] When this unit is placed on R, if you have a vanguard with “Descendant” in its card name, you may pay the cost. If you do, your opponent chooses one of their rear-guards, and retires it. AUTO [R]: [Put this unit into your soul] When your unit with “Descendant” in its original card name is placed on V, you may pay the cost. If you do, choose one of your opponent’s rear-guards in the front row, and retire it.